When perusing the team list for this year’s Windmill Windup, this Southern Skies team caught my eye. Windmill’s reputation as an international tournament has been ever-increasing, and this year, Southern Skies will become the first team from the African continent to attend the tournament. I spoke with Corne Badenhorst and Sandra Jordaan to get the lowdown on his team and why they feel Windmill is well worth the long flight. What is Southern Skies all about? Southern Skies at a skeleton crew training session before the tournament. The Southern Skies are a combined team consisting of mostly Cape Town club teams like Chilli, Maties, Ghost, Salusa, UCT and Ultitude (Johannesburg). We also have three players from Johannesburg (two who have previously played in Cape Town) and three more players who currently reside in Germany. It’s a team put together as a representative for Cape Town and South Africa at Windmill. Despite being from different clubs, we have had a great time training and playing as a team in preparation for Windmill. We all knew each other pretty well before joining the Southern Skies squad and are enjoying getting to play together and learn from one-another. Cape Town Ultimate is the biggest single-region ultimate community in the country and we are super passionate about the sport. CT is a windy city with winter rain, but we do not understand the concept of an off-season and we are on the (outdoor) field no matter the season or weather! Our team name and kit were inspired by the magnificent sky-line of Cape Town: the breath-taking sunsets behind Table Mountain and our night sky with the Southern Cross pointing one’s gaze over the starlit Atlantic Ocean! It’s an athletic team, and we’re planning to play some impressive ultimate, and maybe even be responsible for an upset or two at Windmill. You’re flying a long way for an ultimate tournament. What about Windmill most attracted you to make the journey? It’s labelled as the biggest grass tournament in Europe, and everyone you chat to who’s been to the tournament have good things to say about it. Also, it’s advertised as a high ultimate standard tournament, but it’s also a tournament to have fun at off the field. It’s also serves as preparation for Club Worlds next year for a few of us. It sounds like we’ll be sending mixed teams next year, so this will be good exposure. Are you playing other tournaments as well on your trip, or just Windmill? On this trip we are only attending Windmill, though some of our team members are also attending the Rise Up training camp in the week before. Are you just made up of players from South Africa, or do you have international players as well? We have four international players on Southern Skies: our captain, Steve Crawford, is from the USA but has been living in Cape Town for 7 years. Brianna Mersey is from Canada and has been living in Cape Town for 3 years. 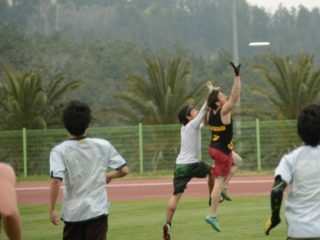 We are also picking up two German players, one of whom (Lutz Bergmann) played ultimate in Cape Town for several months in 2012/2013 while working here. All our other team members are South African and play or have played in Cape Town, though some have recently moved abroad or to other cities. It will be great getting them all together again for this tournament! What player is most likely to make a huge play as a thrower? As a receiver? On D? The team is always looking for ways to spice up their fitness at trainings. Rob Skelton was part of the mambas team that went to worlds last year. A big left handed mid receiver with big throws, one of the best throwers in the country (editor’s note: since conducting this interview, Corne informed us that Skelton will be sidelined with an injury). Sandra Jordaan, Cady Roberts, Brianna Mersey, Marlise Richter, Nick Langley and Mike Warren were part of the mixed team that went to worlds last year (the Marakas). Mike is a good all round cutter. Sandra and Cady are ladies with a lot of pace who’ll be scoring a lot of points at windmill. Marlise is a solid handler. Brianna is a solid all rounder, can handle and is a pacy cutter too. Steve Crawford is the captain, has decent throws and a good athlete. Hendri Botha, another lefty cutter/handler that has good huck. Julia Harris is probably our best female defender. Never stops running. Will layout for the disc. Ever-improving player. And then me. I’m a D-line cutter, and I’ll put in a layout or two and be all over the place. Our team is really not built around any superstars but we will really need contributions from everyone to be successful. We expect to see a lot of develop among our newer players during this tournament. Can you share a tradition, piece of history, or other trait that makes ultimate in South Africa unique? The Mambas [South Africa Open] won the best (warmup) song at Worlds with their rendition of shosholoza. The Marakas won the spirit prize last year. South Africa is an ever growing hub for ultimate, with a 16 team nationals championship Mixed) and the first official intervarsity match in Africa (Maties vs UCT) in 2012. South Africa being a sport crazy country, we are blessed with a good group of very athletic ultimate players. I suppose that influences the basic ultimate style in RSA. We never stop running and will punch above our weight. SA players are fiercely loyal to their sport and their clubs, but above all we have a strong focus on the spirit and community of the sport. Any person visiting South Africa will always receive an warm, enthusiastic welcome from our ultimate players. If you have nowhere else to go and don’t know anyone, come play ultimate, you will immediately have a fun, friendly environment and a community to be a part of. What are your team’s goals for the tournament? We have a competitive team. Thus, we are aiming to be competitive. It’s an experienced team by South African standards, and being unknown at the tournament, we hope that will play into our hands and lead to a few big wins. All photos in this article courtesy of Jaco Swanepoel.